This is one of those images that makes me wish we had room in our destination wedding kit for a pair of walkie-talkies! 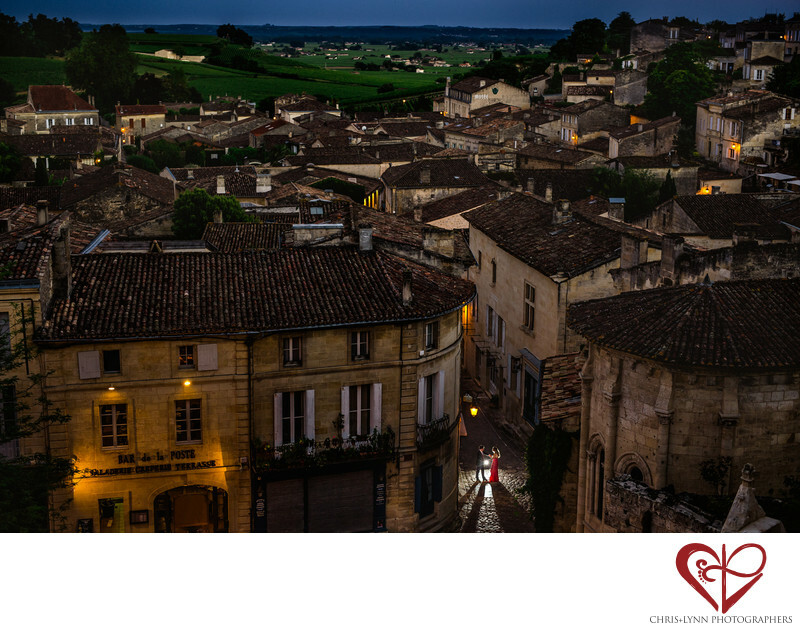 As we always do prior to a destination wedding or destination portrait session, we had scouted this vantage point overlooking this adorably quaint French village several days prior to our shoot and pre-planned this image as an epic finale to our destination bride & groom session. After roaming the cobble-stoned streets for a couple of hours shooting hundreds of portraits in the glorious light of a French summer evening, we sent the bride and groom into the village square below. The groom (a keen amateur photographer himself) was carrying our Gorillapod-mounted Canon 600-RT Speedlite flash that he would place on the ground behind the couple to provide backlighting and background separation. We would stay in the upper part of the town in order to keep this aerial perspective of the village and the surrounding French countryside. The plan was for us to phone the couple when the reached the village square. When they were in position & the light was just the right shade of twilight we placed the call. Nothing .... no service. We sent a text ...... message send failure. But we just had four bars of service 10 minutes ago!!!!! AGGGGHHH! Luckily, a back-up plan was in place! The groom already knew to put the flash on the ground directly behind the couple, and they began to spontaneously dance in the village square. I had a Canon ST-E3-RT radio transmitter mounted on my Canon 6D camera to trigger the flash, but the distance of around 100 meters was just too great and the flash and transmitter were only synching intermittently. I was able to fire off only a few shots with the flash before we lost the light, and this frame ended up being my favorite. 1/160; f/2.2; ISO 200; 50.0 mm.